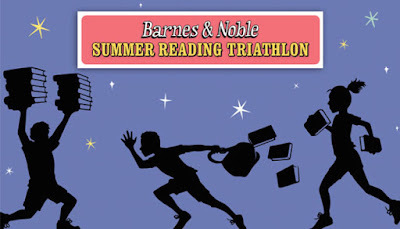 Kidliterati: Reaching Readers: Through FREE BOOKS! Reaching Readers: Through FREE BOOKS! Summer is quickly coming to a close (What?! I know!)... And if your kids are anything like mine they're scrambling to finish up their summer reading goals, pledges, and contests. No crazy goals. No crazy timelines. And, oh, did I mention? FREE BOOKS! That's some serious incentive! 2. Hand it in at your local B & N.
3. Pick a FREE book from the list on the form (some seriously GREAT books here!). Once completed, they'll even offer to announce the child's name over the loud speaker in congratulations. My girls declined (probably because they knew their parents would whoop and holler and completely embarrass them), but how cool! Kids have until September 6th, 2016 to turn in their reading journals and claim their free book. However, closing ceremonies for the Summer Reading Triathlon will be held on August 27th with the announcement of which heroes and places took home the gold, silver, and bronze metals.